Generalized anxiety disorder (GAD) is one of the most prevalent anxiety disorders, with important implications for patients and healthcare resources. However, few economic evaluations of pharmacological treatments for GAD have been published to date, and those available have assessed only a limited number of drugs. 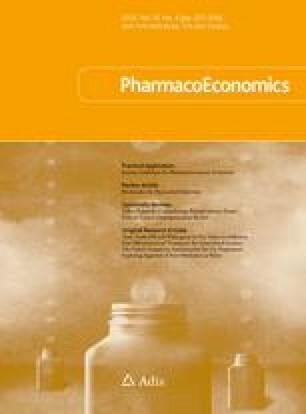 To assess the cost effectiveness of pharmacological interventions for patients with GAD in the UK. A decision-analytic model in the form of a decision tree was constructed to compare the costs and QALYs of six drugs used as first-line pharmacological treatments in people with GAD (duloxetine, escitalopram, paroxetine, pregabalin, sertraline and venlafaxine extended release [XL]) and ‘no pharmacological treatment’. The analysis adopted the perspective of the NHS and Personal Social Services (PSS) in the UK. Efficacy data were derived from a systematic literature review of double-blind, randomized controlled trials and were synthesized using network meta-analytic techniques. Two network meta-analyses were undertaken to assess the comparative efficacy (expressed by response rates) and tolerability (expressed by rates of discontinuation due to intolerable side effects) of the six drugs and no treatment in the study population. Cost data were derived from published literature and national sources, supplemented by expert opinion. The price year was 2011. Probabilistic sensitivity analysis was conducted to evaluate the underlying uncertainty of the model input parameters. Sertraline was the best drug in limiting discontinuation due to side effects and the second best drug in achieving response in patients not discontinuing treatment due to side effects. It also resulted in the lowest costs and highest number of QALYs among all treatment options assessed. Its probability of being the most cost-effective drug reached 75 % at a willingness-to-pay threshold of £20,000 per extra QALY gained. Sertraline appears to be the most cost-effective drug in the treatment of patients with GAD. However, this finding is based on limited evidence for sertraline (two published trials). Sertraline is not licensed for the treatment of GAD in the UK, but is commonly used by primary care practitioners for the treatment of depression and mixed depression and anxiety. The online version of this article (doi: 10.1007/s40273-013-0031-z) contains supplementary material, which is available to authorized users. The economic analysis presented in this paper was undertaken to inform a clinical practice guideline on anxiety (partial update) developed by the National Collaborating Centre for Mental Health (NCCMH), commissioned and funded by NICE in the UK . The authors’ work was independent of the funding body. All authors have no conflicts of interest to declare. The authors would like to thank the GDG of the anxiety guideline (partial update) for useful comments on the development of the economic model and the interpretation of the results. Special thanks to Philip Cowen (University of Oxford, UK) for expert advice on the development of the economic model and the interpretation of findings, as well as for useful comments on previous drafts of the manuscript. We also acknowledge Sarah Stockton (NCCMH) for creating the search strategies and conducting the database searches used for the anxiety guideline as well as the updated searches used in this study. IM, NM and TK were paid by the NCCMH to undertake the development of the partial update of the anxiety guideline. JC was chair of the GDG. IM conceived and developed the economic model, undertook the network meta-analyses and drafted the manuscript. NM conducted the systematic review of clinical literature. JC and TK served as clinical experts for the development of the economic model. All authors contributed to the interpretation of the results. NM, JC and TK critically reviewed the manuscript. All authors approved the final version submitted for publication. IM is the guarantor of the study. European Medicines Agency. European assessment report: LYRICA. London: EMEA; 2006. http://www.ema.europa.eu/docs/en_GB/document_library/EPAR_-_Scientific_Discussion_-_Variation/human/000546/WC500046605.pdf. Accessed 27 Oct 2011. GSK. Clinical evaluation of BRL29060A (paroxetine hydrochloride hydrate) in generalized anxiety disorder (GAD): a double-blind, placebo-controlled, comparative study. India: GSK; 2005. http://www.gsk-clinicalstudyregister.com/result_detail.jsp?protocolId=BRL29060A%2f856&studyId=573BB223-06D2-4684-A2C3-D76E7488CC42&compound=Anxiety+Disorders&type=Medical+Condition&letterrange=A-F. Accessed 27 Oct 2011. GSK. A randomized, double-blind, placebo-controlled, flexible dosage trial to evaluate the efficacy and tolerability of paroxetine CR in patients with generalised anxiety disorder (GAD). India: GSK; 2002. http://www.gsk-clinicalstudyregister.com/result_detail.jsp?protocolId=29060%2f791&studyId=A32F4E7C-163F-4838-9658-B607CF41EC88&compound=Anxiety+Disorders&type=Medical+Condition&letterrange=A-F. Accessed 27 Oct 2011. AstraZeneca Clinical Trials. A multi-center, double-blind, randomized, parallel-group, placebo-controlled phase III study of the efficacy and safety of quetiapine fumarate extended-release (Seroquel XR) as monotherapy in the treatment of elderly patients with generalized anxiety disorder (CHROMIUM study). AstraZeneca; 2008. http://www.astrazenecaclinicaltrials.com/search/?itemId=8543681. Accessed 27 Oct 2011. Barbui C, Cipriani A. Fluoxetine top of the ranking for GAD: garbage in, garbage out? [rapid response to Baldwin D, Woods R, Lawson R, et al. Efficacy of drug treatments for generalised anxiety disorder: systematic review and meta-analysis. BMJ 2011 Mar; 342: d1199]. BMJ 16; 2011. http://www.bmj.com/content/342/bmj.d1199?tab=responses. Accessed 27 Oct 2011.